Teaching letter names or sounds doesn’t have to be done in dry, drill-and-kill style. 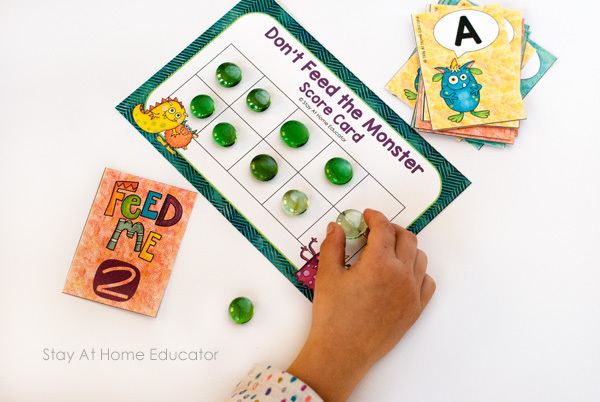 A monster alphabet game like Don’t Feed the Monster is just the opposite. It’s interactive, hands-on, super fun, and even a wee bit silly. And as an added bonus, children also get to practice their one-to-one correspondence skills, too! And be sure to read all the way to the end of the post to find 16 other awesome friendly monster activities! I still hear pretty frequently of parents and teachers relying on flashcards for teaching important foundational skills in reading and math. But here’s the problem: flashcards only really result in rote memorization. This means if you’re using flashcards alone, you’re only really scratching the surface . . . of a foundational skill. Now, let me be clear. Flashcards are fine for some kids. Some kids really respond to them. My first grader, for example, loves sight word flash cards because she is so competitive, even if only competing against herself. 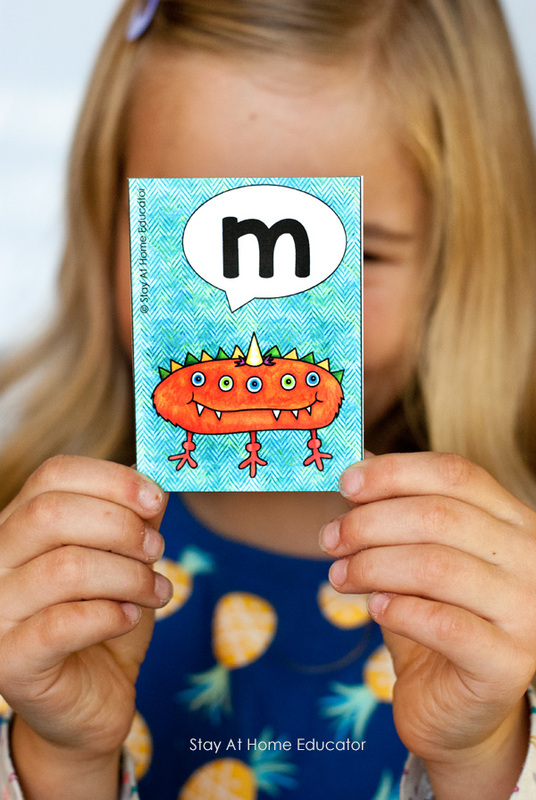 But I’ve never met a preschooler who asks for flashcards over a crazy fun monster alphabet game. 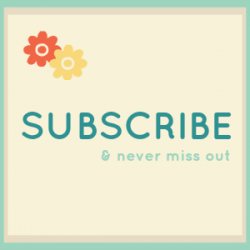 So don’t forget to get your free printable at the end of this post. Your preschoolers will be asking for it again and again! This game not only teaches letter recognition or letter sounds, but it also exposes children to ten frame counting skills and one-to-one correspondence skills, too! All in a fun, yet simple, alphabet game! Print the game and cut out the cards. Mix up the cards and place them in a pile face down. Give each player a scorecard and invite them to fill their ten frame. Now that the letter game is set up, you are ready to play! Draw a card from the pile and identify the letter and/or sound, then place in a discard pile. 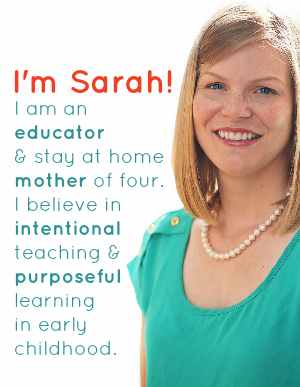 If your preschooler needs help, that’s ok! This is supposed to be fun. It’s not a test. Just tell them the letter name and have your preschooler look at the card and then repeat the name. If you teach a wide range of levels, I’ll give you lots of variations of play down below. Once those counters (otherwise known as monster food) are set aside, the player must say, in their very best monster voice, “Chomp, chomp” or “Gobble, gobble,” and maybe add in a burp. Adding in a burp at the end makes it really silly because the rest of the players get to say, “Monster! Say excuse me!” which always results in gut-rolling laughter. You and I both know that preschoolers develop at their very own rate. This means that not all preschoolers are able to play this game exactly as described above. Here are some different ways to play so your children can learn the best. Make multiple copies of the game, pulling out a small set of letters (about six) that the child is most familiar with. Set aside the other letters and the extra “Feed me” cards. Play the game as described with just a small set of letters. Play as described above, but use the letters from the child’s name. Say the letter for the child, then invite him to use his finger to trace the letter as he says it. Invite the preschooler to say both the letter and sound on the card. Have your child name something that begins with the card’s letter sound. 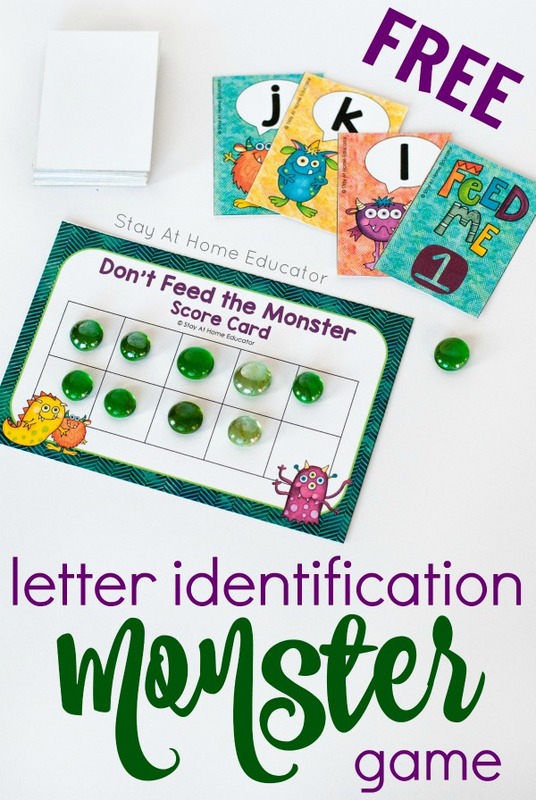 My preschoolers love to play alphabet games like these all year long, and this monster game quickly became a favorite. With just the right amount of rules and silliness, it’s such a fun and effective way to reinforce alphabet skills. Think your preschooler will love this game? (I know they will!). 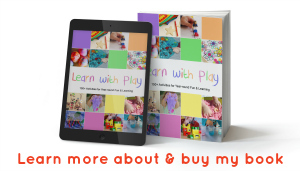 You can grab your free copy by clicking on the Stay At Home Educator download button below! Want More Monster Themed Activities? 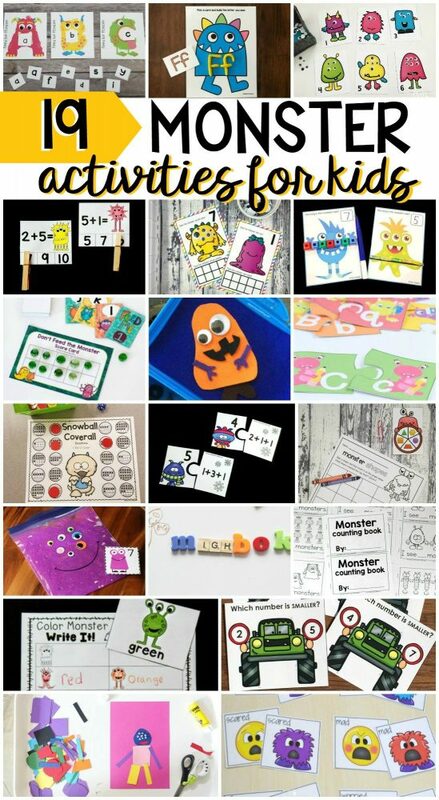 Then check out these amazing activities! They are too fun!